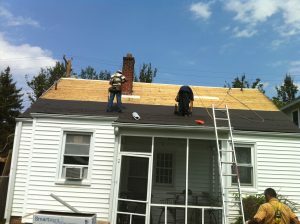 Shingle roof repair or replacement? What’s best? This roof took a beating in high winds. 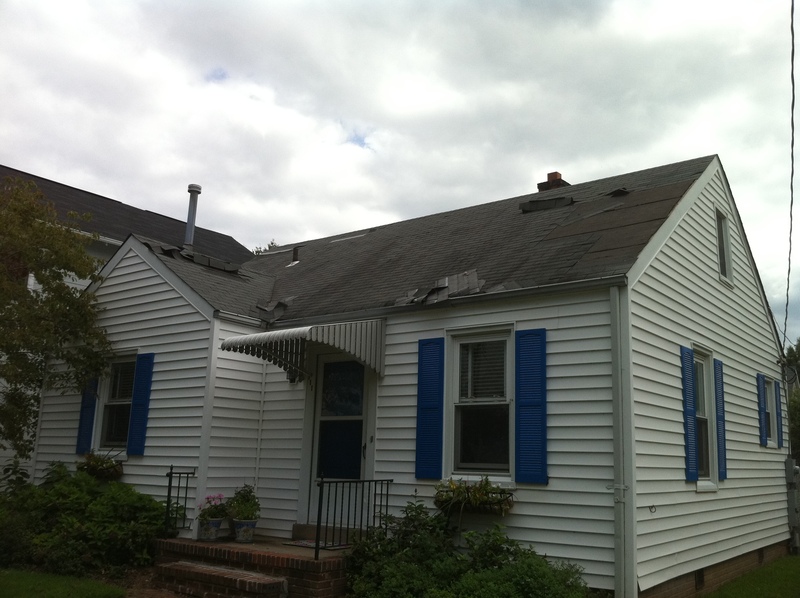 When looking over the necessary repairs it became obvious that replacing the missing and damaged shingles would make the roof look terrible. The roof as you see it below is around 15 years old, and like most things left outside for 15 years, it has a good amount of algae and dirt accumulated on it. 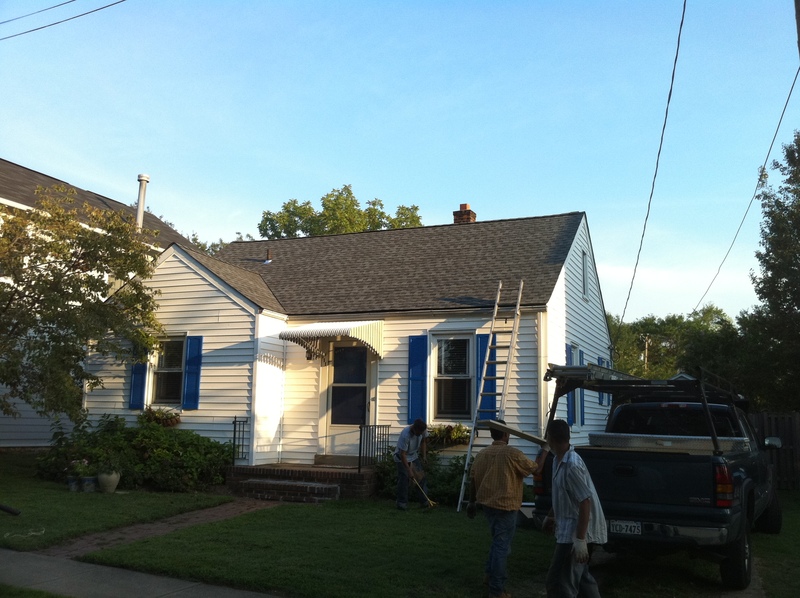 Installing new, clean shingles into a dirty roof would look terrible. The homeowner decided she didn’t want to see the front of her house looking even worse than it does with the missing shingles. 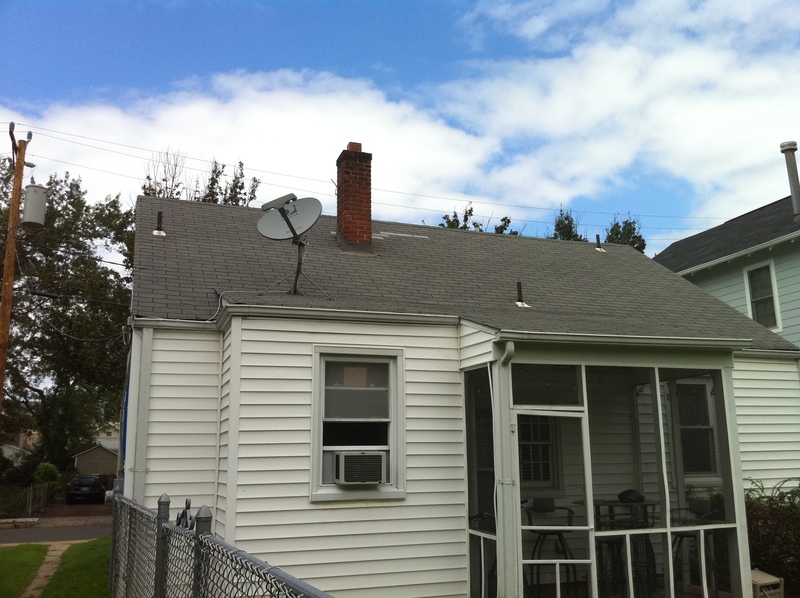 The one new shingle from a previous repair (you can see it above the chimney) is glaringly obvious, based upon the age and probable plummet in curb appeal, my client decided to replace the roof. Step one: Tear off. 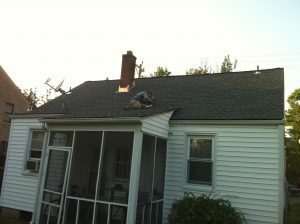 After the old shingles were removed we replaced some rotted and cracked pieces of roof decking. Step two: We installed new drip edge and waterproof underlayment. 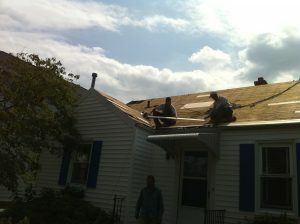 Step three: We install new GAF Timberline shingles in Pewter Gray. We also installed new copper flashings on the chimney, new pipe collars on the plumbing vents, a new ridge vent and ridge caps. We also reset the satellite dish, cleaned and re nailed the gutters and flushed out the downspouts. Step four: Final clean up, we sweep the yard, the flower beds and the driveway with a magnetic nail bar (yellow handled bar) to pick up any bits of metal left behind. 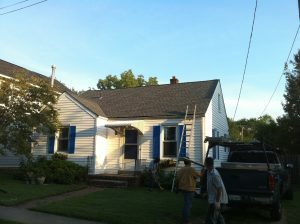 My goal is to leave nothing but a beautiful new roof behind. There are about 165 more steps than what I’ve shown you here; but I’ve found that most homeowners don’t want to read about psi settings on the compressor or flashing techniques. 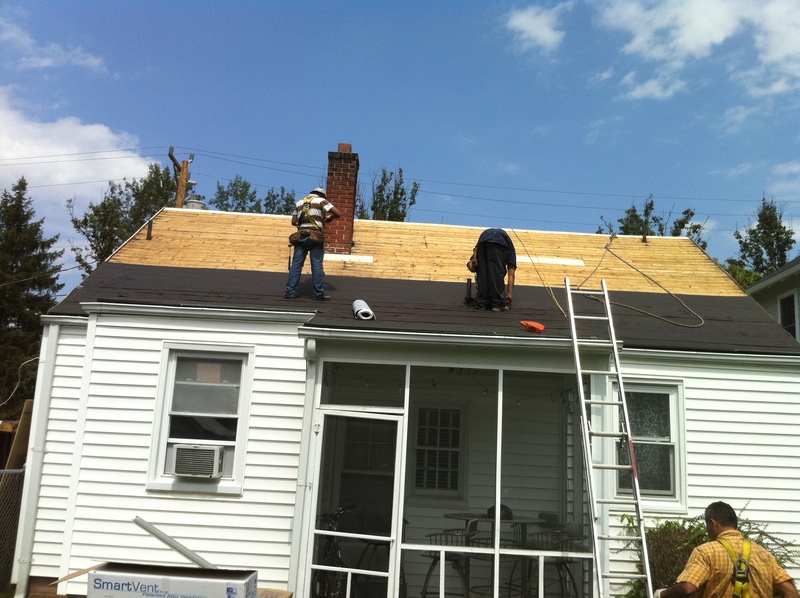 However, if you want to hire a roofer who cares about compressor settings, european flashing techniques and making your house beautiful then you should call me; I promise I won’t bore you with all the details (unless you want me to).